I just wish I had more time to play. We all want that awesome Pinterest looking home office at home where we feel creative, inspired, happy.. A place we feel drawn to. 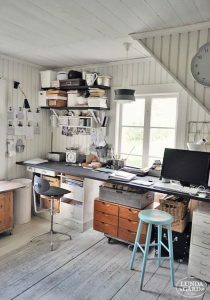 I don’t know about you, perhaps you already have the perfect space? 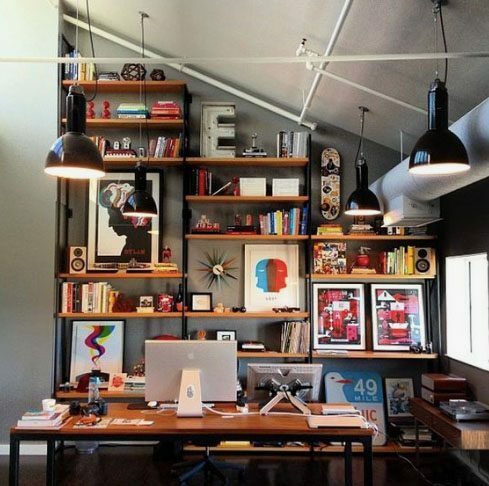 But I find it’s not always so easy to put together a really nice home office. There are always limitations, space, light, weird wallpaper, questionable furniture.. And even if you have all the nice things, perhaps you still feel like it’s not quite what you envisioned. So, let’s take a look at what we can do to improve our happy space at home. With just a few modifications… lots of modifications if you’re in trouble 😛 We should be able to amp up our space with minimal effort! 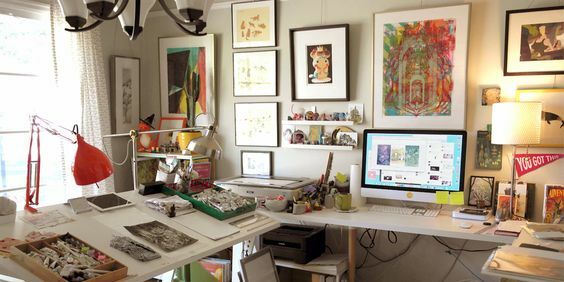 When we think of an artist’s space, we usually think of a lush room, filled with shelves, tubes of color, brushes, reference images, a drawing board packed with sketches.. All of that good stuff. And of course, there is nothing wrong with it. Easy to keep clean and tidy! But I think we can all agree that it ends up looking a bit empty. So what can we do to make our space a bit more inviting? Adding an open bookcase can really help to eliminate emptiness. You probably don’t have this ceiling 😛 But you get the idea. 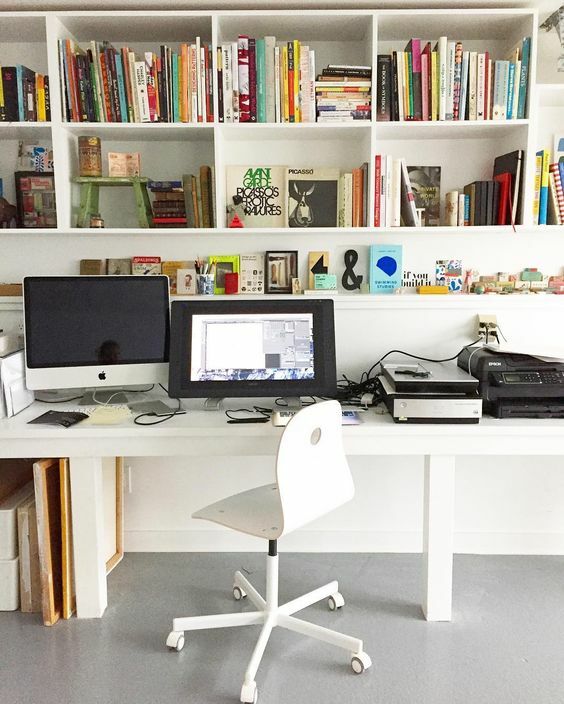 As you can see, using a stylish bookcase, bookshelf or just shelves on the wall can really help transform an office that would otherwise look quite boring, into a much brighter, more inviting space. This is also a great opportunity to put your favourite items, books, toys, art prints etc on display. Careful though, don’t overdo it, and keep tabs on the colors. Pay attention to the later image above, all the art prints have a similar red color in them, this creates cohesion, so keep that in mind. 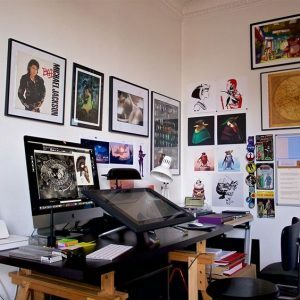 Don’t be afraid to pepper your walls with prints, art, photos, or anything that inspires you really. Putting up even just a few things on your walls will make a bigger difference than you might think, give it a go! 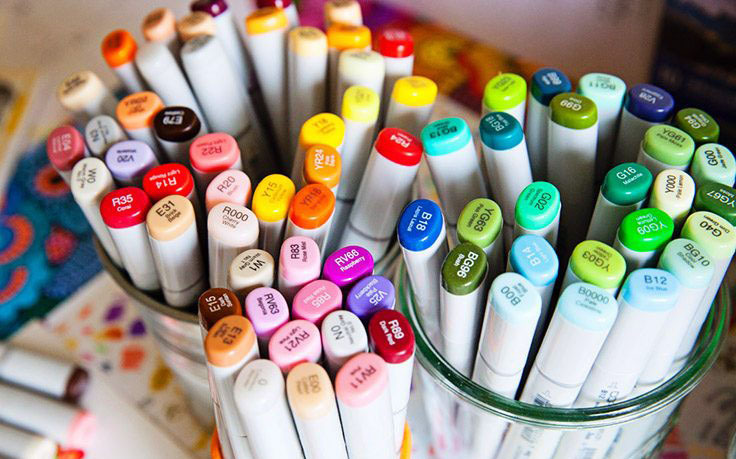 I hope you are not hiding all your beautiful markers, neatly organized in a drawer somewhere?? Take them out, and put them on your desk! Get nice plastic cups, plastic holders, baskets, whichever you prefer..
And put your markers in them, it helps with adding a pop of color to your room, and enforces the “artist” look. But wait you say! I don’t have any markers! I’m a digital artist! Well stop complaining and go buy some! Although if you want the pro look.. Copic markers or go home. A lot of artists favor the L setup. 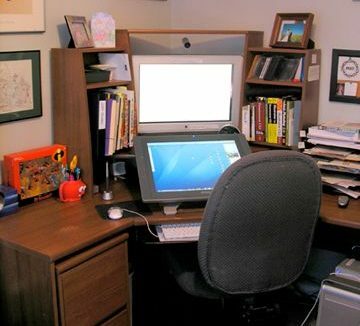 Basically tables aligned as an L.
You keep your computer on one table, and, if you are a lucky Wacom Cintiq owner, Cintiq goes on the other table. This not only looks great but also provides excellent accessibility to switching back and forth. It also helps with keeping your home office compact. But be careful here, if your room is too small, don’t do it! Or it might look like this! These units were popular in the 90s and unfortunately, are still around. 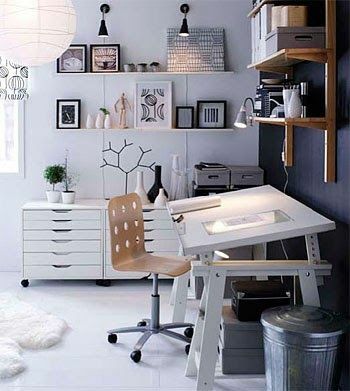 Consider skipping that corner unit if you are short on space, there are still plenty of ways to make it work. And to be honest, looking at the picture above, it doesn’t really look like it’s adding any space value even though it’s a corner unit. Also, I tend to stay clear of these units that have a little pedestal thing, wrapping around the monitor. I personally don’t find it very appealing. 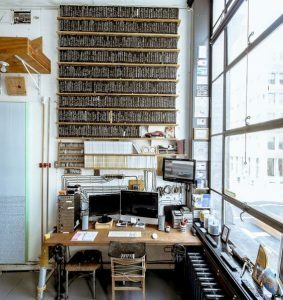 I prefer more of an airy setup. A straight setup can look great as well! 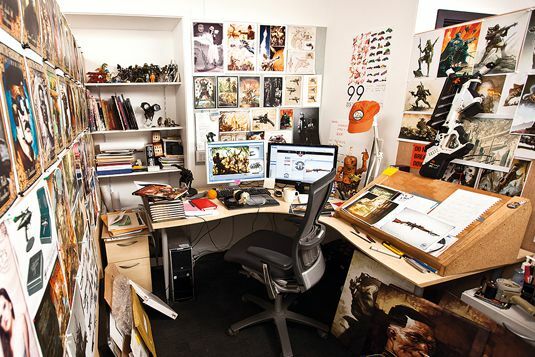 Especially a wall to wall desk. I used to have that and I loved it! Going back to the beginning of this article, talking about our space feeling a bit empty. It’s empty! 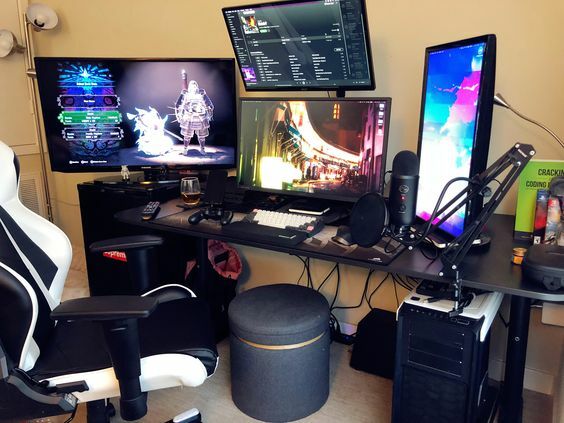 I NEED MORE MONITORS! Weeell, yes maybe, but do you really? I know you feel like Neo in The Matrix. But there are better ways to fill up your space. 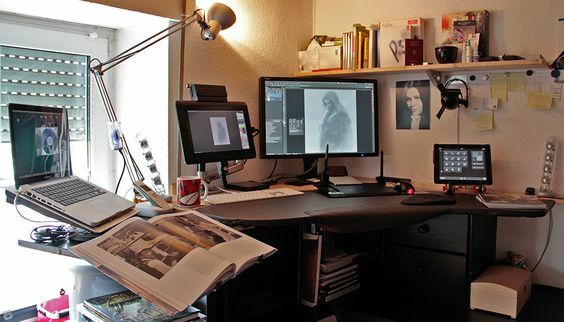 Personally, 2 monitors and one Cintiq is the maximum I’ll ever need. If even! 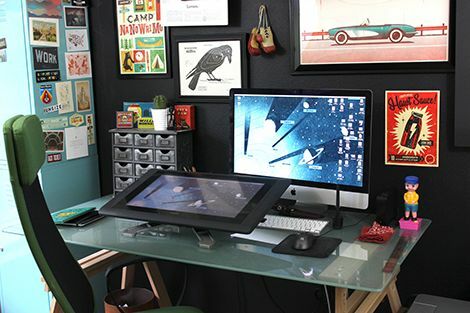 If you hook your Cintiq up to an arm, you can swing it back and place it next to your monitor and use that as your secondary monitor. When you need to draw, just pull it towards you and get cracking. 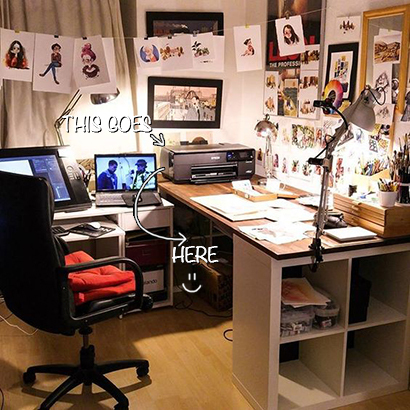 This is also a great solution if you are short on space. 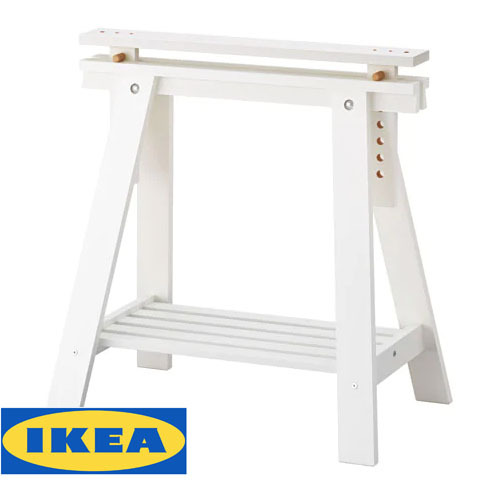 The most versatile product IKEA has produced for artists. 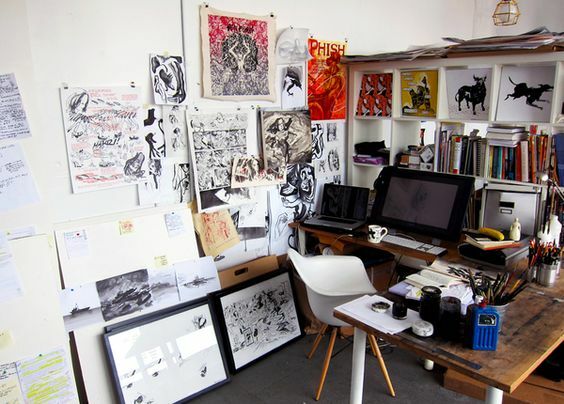 Have a look around Pinterest for some artist office inspiration. It’s actually quite hard to find a picture where a Finnvard is NOT present. I really recommend using these, as they are cheap, look great, and you get the legendary tilt! 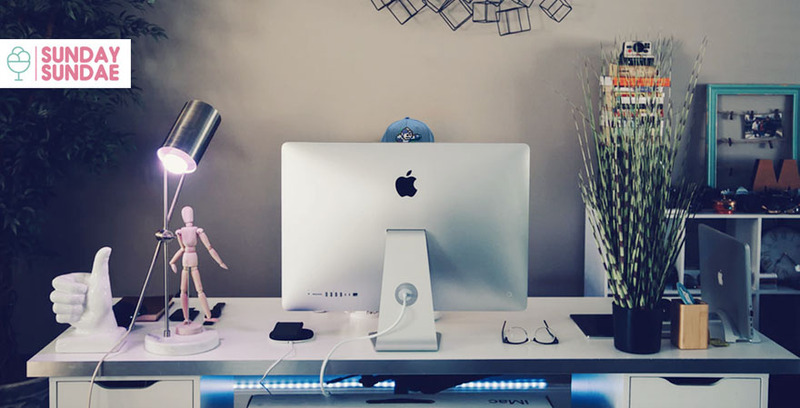 Adding a tilted desk, especially to an L shaped setup, can really help enhance your look. I know, it can be a bit annoying with a tilted table. But consider it a great placement for your Cintiq, make a solution to clip on some plastic boxes or baskets and put your markers in them. Get a clip on lamp on there. It looks great and it’s worth it! Generally, I tend to start with white. 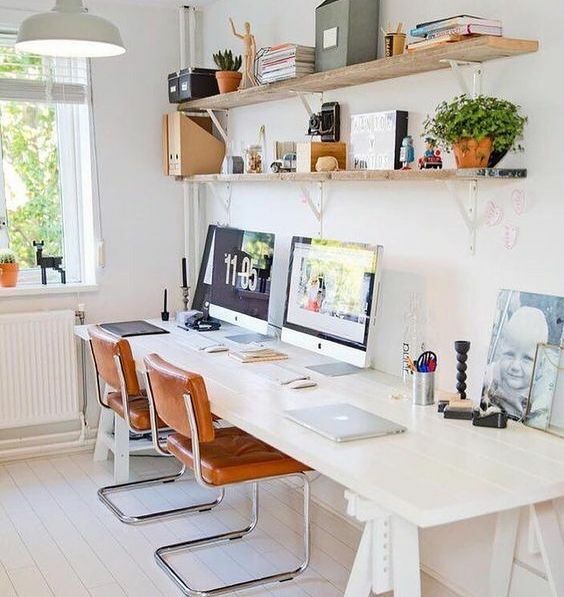 White walls, white chair, white furniture, basically, a white base. 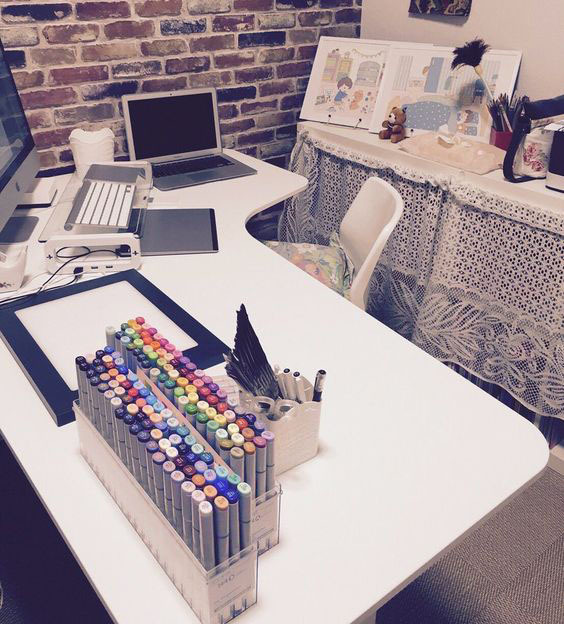 I then add color using decoration, such as books, toys, markers(! ), posters, etc. This gives a nice airy, clean feeling. It also makes it easier to switch up your colors in your room. Re buying furniture and repainting the walls is not easy work. Wood furniture can be nice as well, but make sure to not have ALL your furniture be wood, it can get a bit dark. 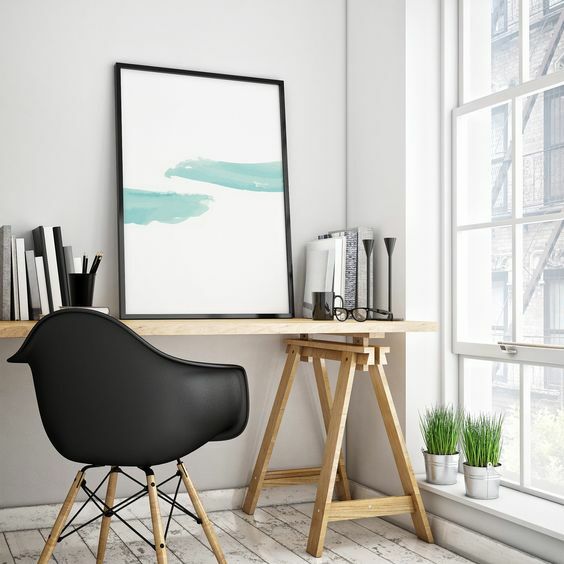 If you do opt for something like a dark accent wall, or dark furniture. Make sure to counter this by adding bright artwork etc. Easy to forget, but adding a plant or two helps a lot. It adds a splash of color and interest. They don’t need to be big either, a row of small cacti is a nice touch. But a medium sized plant with large leaves can transform your room alone. 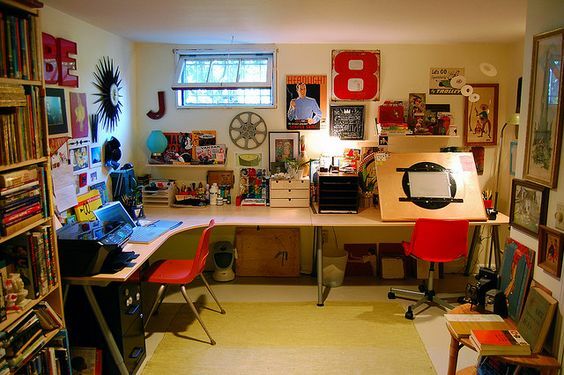 Another thing that can greatly improve your room is to have a space for reference material. I love the look of a big open Art book. This could go really well on your tilted table as well. 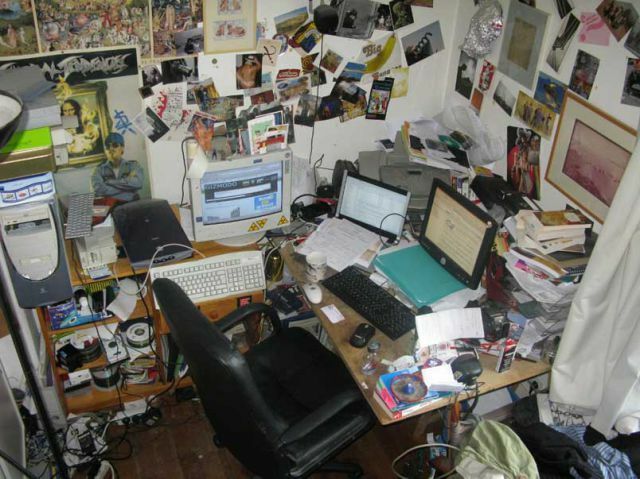 If you have a window, avoid putting your desk in front of it. 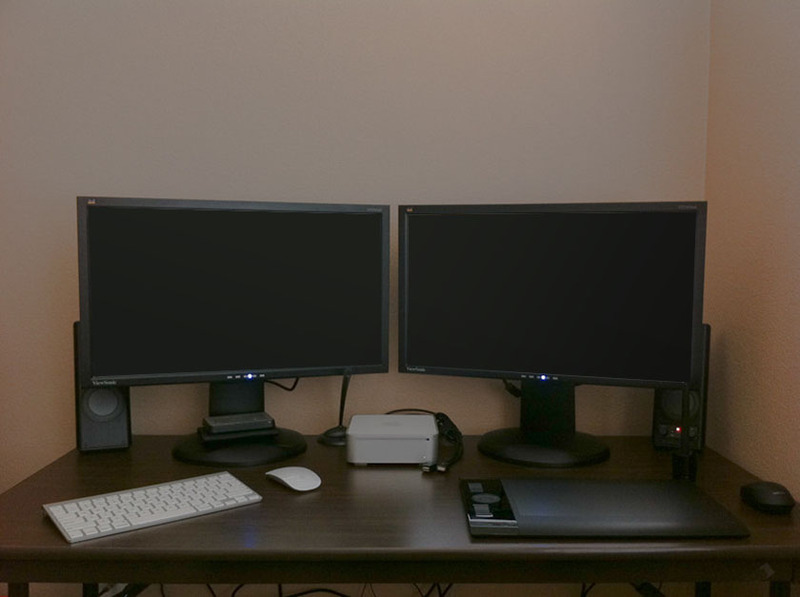 Large monitors will block a lot of light from coming in, contributing to a dingy “basement” look. Hanging things from the ceiling can be a nice option, I know what you are thinking. Airplane models.. Can be great! But there are other options. 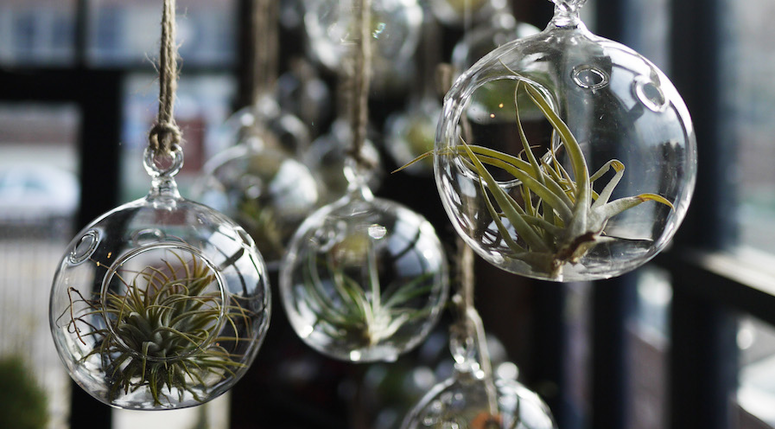 Air plants are getting very popular, my wife hung some above my desk in the last place we used to live in, it looked fantastic. Love this!! I am holding out for a 4k, color-accurate monitor. I’ve always wanted one of those 21:9 curved buddies but the prices skyrocket pretty fast. Right now I’m using two monitors from the thrift store. I’m a Graphic IT student and a blogger, it was weird making my logo when I’d switch screens, the colors would be dramatically different! Cheaper upgrades I have on the back-burner are more wall art and plants. Unity VS Unreal – Which Engine Should You Choose?